I need foot surgery. Years of running and exercising with the wrong shoes for my high arches created some issues with my big toes. I have been managing the pain with cortisone shots for the last few years, but don’t want to continue steroid injections as frequently as I have been getting them. So, its time to bite the bullet. I don’t want to miss out on travel while we are living here in Europe, so I decided that winter in Geneva is going to be my best bet. We have heard winter here can be nasty, so why not opt for my 8-12 weeks of recovery time then? Gabe begs to differ that I’ll miss out on ski season but I suppose I’ll be forced to sit in the chalets sipping delicious chocolate chaud instead. Oh well, there are worse things in life. Besides, have you HAD the hot chocolate here? Out of this world…. I decided that I should probably find a doctor now so I can plan out the surgery. Luckily, we have an agency that is here to help ex-pats like us with finding doctors. Before we continue, I have an admission. I procrastinate making simple calls like this here in Geneva because I am embarrassed by my French skills. Thus, I am uncomfortable doing errands and calls that I could do in the US four-at-a-time with my hand behind my back. However, I finally called Friday at 4pm, after putting it off all day. This particular day, I was lucky enough that I got someone who spoke some English. She called back later that evening saying there was an appointment Monday. I couldn’t believe my luck. All that putting off and I had an appointment for Monday! The only other time I went to the doctor here, it was to the chiropractor. He could speak a little English, I could speak a little French. All went fine and I felt great afterwards, but this time, I decided to do a little preparation to make the language gap easier. In addition to the x-rays and detailed medical files I had organized to bring, I worked on a timeline and case history of my feet (the image above). I detailed all the surgery options that my podiatrist and I had considered in the US and listed out my preference. I listed my questions. And then I popped it in Google Translate and printed both, in English and French. That way, if there were any issues with a part of it, I figured I’d know what part there was confusion on and I could do charades or something. A combination of charades and broken French usually works with the maintenance folks who come to the house. I cut right to the chase and handed her my packet. She studied it, reading my detailed explanation. She looked confused. “J’ai aussi les x-rays” I added and started to hand them to her. She sighed. “J’ai peut couper vos ongles”. Lesson learned: a podologue is actually a person who does pedicures. She kindly handed me a card of an orthopedie who could do the surgery, located in a town 30 minutes away. But, I’m going to wait a little bit I think to book an appointment. I am trying to scrape all my self esteem off the floor in the foot spa where I left it. 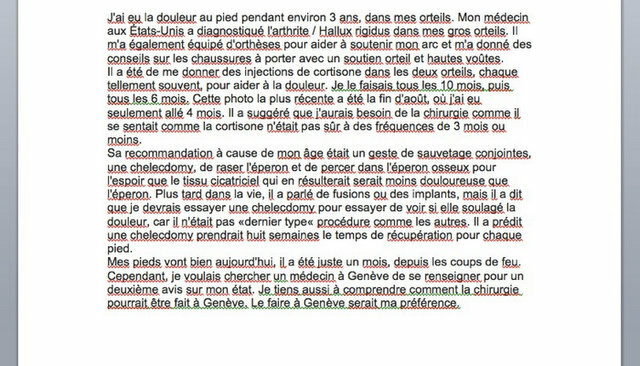 This entry was posted in Health, Learning & Growing, Life in Geneva. Bookmark the permalink. Hahahaha!!!! I love it. Isnt it amazing the little things we try to avoid bc of the French? I would pay to see that woman’s reaction. This is just hilarious. Thanks I needed the laugh today. Hope you got a nice pedicure. Ahhh, c’est vachement drole ! Hilarious,Lauren. I loved it.